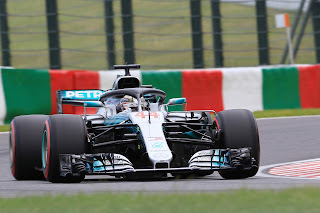 Lewis Hamilton in the Brazilian Grand Prix won his 10th race of an imperious 2018 season. Ho-hum. Not even that Hamilton had never before won a Grand Prix after taping up that year's title stopped him this time. 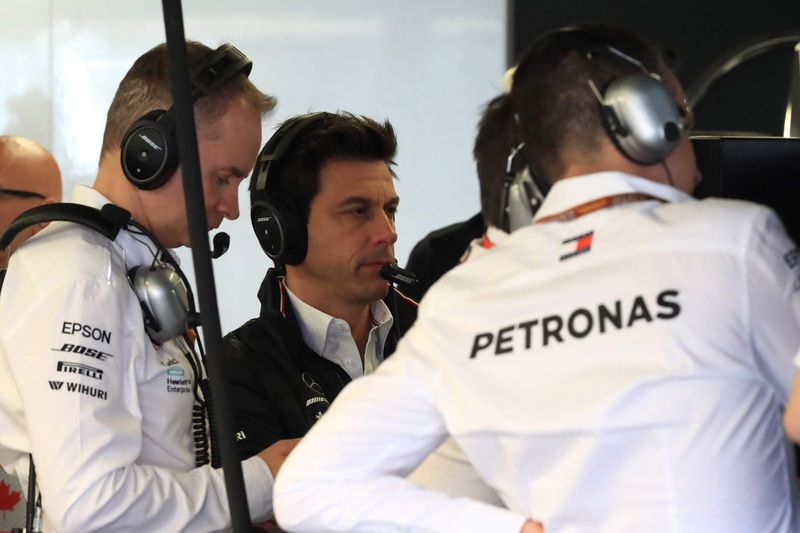 Mercedes with it sealed its latest constructors' championship. Ho and indeed hum. Not a bit of it though. The above paragraph holds only if one falls foul of the old one about judging books by their covers. This one at Interlagos was a thriller, with massive detours on the way to what appears its very standard outcome. The source of the intrigue was unforeseen too. It wasn't because of an anticipated Ferrari challenge to Mercedes, as that didn't arrive. Despite Sebastian Vettel qualifying a smidgen off poleman Hamilton, him reckoning he'd have had top spot without a small mistake. Despite too that Vettel started on more durable tyres. The anticipated rain didn't arrive either. No, it was a thriller because of a challenge to Mercedes that came instead - against anticipation - from Red Bull. Red Bull challenged Mercedes. Red Bull passed Mercedes. Red Bull had this one in the palm of its hand. Until Red Bull lost it. As Red Bull hit a backmarker. And that was only the start of the consternation. 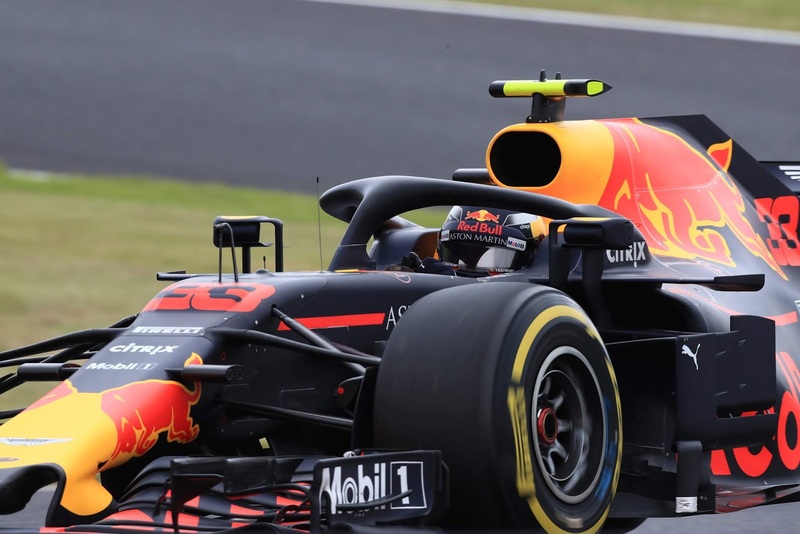 Or rather, for just about all of the above thread it was Max Verstappen's Red Bull in question, though his team-mate Daniel Ricciardo did rise formidably to finish fourth after a grid penalty, fighting for a podium late on. Max was even more of a factor. He got past Kimi Raikkonen's Ferrari for fourth place on lap three and it quickly became clear he was the man on the move. Literally so as the next lap at the same Senna 'S' he got past Vettel's red car for third with a astonishing from-a-mile-back pass on the inside. On lap 10 he'd moved past Valtteri Bottas's Mercedes for second and had a clear run at leader Hamilton. Hamilton pitted on the early side, on lap 19 of 71; the Merc for the third race in a row wasn't at one with its tyres. Verstappen pressed on swiftly until lap 31 - sounding by contrast ever-happier with his rubber as the stint went on - and having pitted and benefiting from fresher tyres sailed past Hamilton to lead on lap 40. That looked like that. But, as intimated, that was far from that. 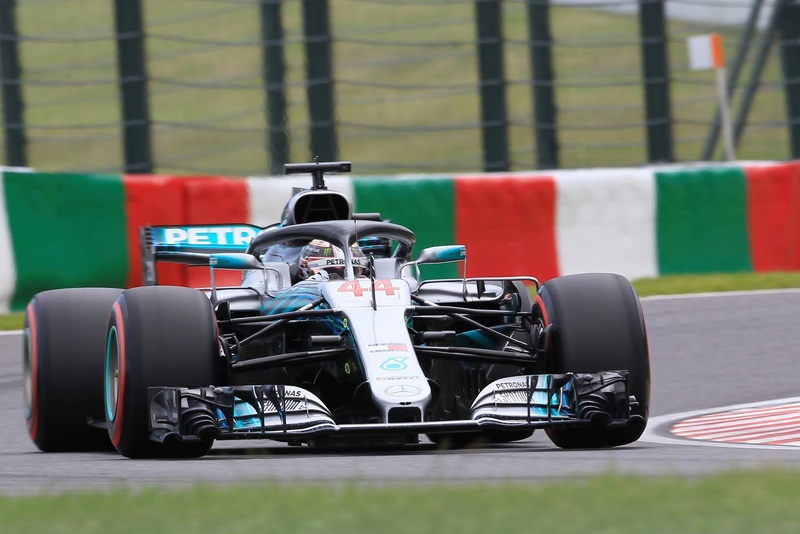 As four laps later Verstappen collided with the lapped Esteban Ocon's Force India, spun, and by the time he's gathered it all up again Hamilton was back in the lead, five seconds up the road. The default assumption at such moments is to blame the backmarker, but on further inspection there was more to it. One is that Ocon, freshly-tyred and fast, was in fact seeking to pass Verstappen rather than the more usual other way round. Unlapping yourself is permitted, but the stewards were correct to conclude that when it is done it should be done with care. Ocon instead went for an 'on-the-edge' outside-to-inside pass at the Senna 'S'. He got a 10s stop-go penalty for his trouble. Yet this doesn't entirely absolve Verstappen. Ocon was alongside his Red Bull and by turning in at the complex's exit Verstappen was guaranteeing the accident. 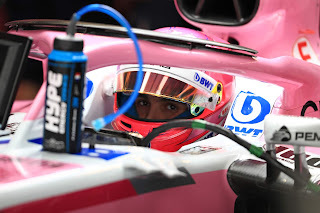 He surely knew Ocon was there - as he'd covered the inside line in defence going into the 'S' - and surely knew too that Ocon wasn't in the same race as him. Hamilton was correct to point out to Verstappen too that he also should have realised the disparity with Ocon in what he had to lose. While Verstappen could claim the moral high ground by seizing the racing line it also lost him the race, which isn't a favourable deal. Not for the first time immaturity mixed with a certain amount of entitlement has cost him. A few reflected that more rounded performers would have let Ocon go. This included Hamilton. "I wasn't surprised by it," he noted later. "I saw them racing but they were not racing for the same position. I would have been in a different frame of mind. Max is that go-getter guy and every now and again it bites you." Max as you might expect saw it a little differently. "We had a great car today," he said. "I'm very happy with that, the strategy was also working really well. We could do our own pace until I got taken out. I think a penalty says enough. If the stewards give him a penalty you know who was wrong in that situation. "You can easily say afterwards that I have much more to lose than him but I'm just trying to do my race. Suddenly a backmarker is trying to race you and taking a stupid risk to dive inside. What can I do about it?" That Ocon and Verstappen have previous, going back to karting, added to the froth. There wasn't a subsequent on-track comeback from Verstappen either, or not the entirety of one. He edged back in on Hamilton but his pace was dulled from then on, likely from floor damage sustained in the clash. Red Bull boss Christian Horner estimated - probably a little fancifully - a loss of a second a lap. Hamilton stayed in the lead until the end, ahead of a stony-faced Verstappen in second. 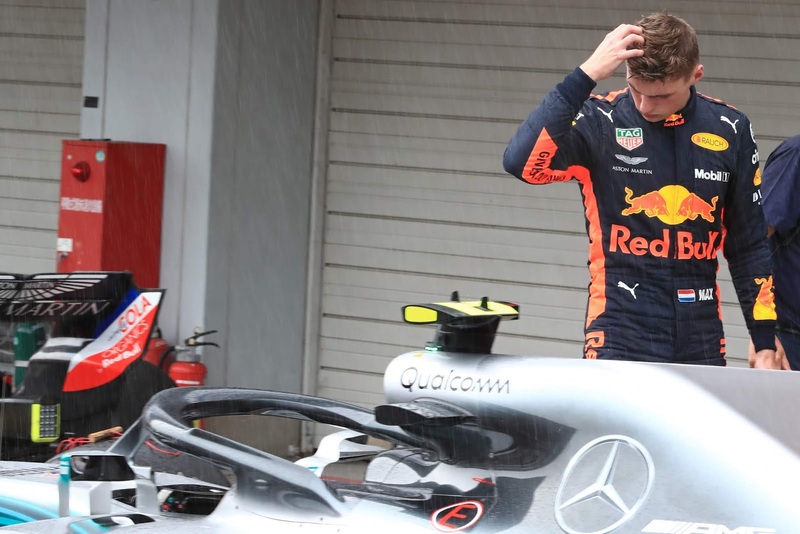 Max was spotted afterwards pushing Ocon in the chest more than once during a remonstration at the post-race weighbridge. That the stewards punished Verstappen for this with two days' community service felt lenient, though apparently both drivers 'said all the right things' in the stewards' presence. No doubt though a few lower down the motorsport food chain who have been thrown out of races, even meetings, for similar conduct will be reflecting whimsically on it all. Another pity among it all was that it distracted from a very good drive from Hamilton, winning amid considerable adversity. Not only that he stretched his second set of tyres to the end after a much earlier than ideal stop, he also more pertinently had engine power occasionally dropping out and at one point his engineers thought his unit within a lap of failure as its exhaust temperatures were so high. As we are often given evidence of these days, there's much more to Lewis than chutzpah. "[They said] 'Well, our exhaust is just about to fail, and we're overshooting all the temperature limits.' I said, 'So what's the fix?' They started to fix it by turning the whole thing down. The temperatures went down to below 1,000, to 980 degrees. But it's still too high! That was truly horrible. That race was just a nightmare until the chequered flag came down." "I could feel it," added Hamilton. "Obviously I've been driving this engine since the beginning, so I know pretty much everything there is to know about the engine and how it feels. "I just stayed focused on trying to do a little bit more lift and coasting, a little bit less full throttle load, even part throttle load, to make sure I go as easy as I can on the engine whilst doing the job. They threw a lot of balls at me whilst I was juggling with the other stuff." As for Ferrari, expected at the outset to be a potent race-day presence? Well Raikkonen continued his recent strong form by driving mightily to third, benefiting from his gentle touch on the tyres. Vettel though trailed in a tepid sixth behind an about as tepid Bottas (both Vettel and Bottas made second stops for tyres too). And it followed on from Seb conspicuously losing his temper having been called to the weighbridge in qualifying, and was another lucky to receive a relatively light punishment. It, once again, seems to betray his frazzled state of mind of late. At least he's got a close season coming up shortly to have a think about it all. But he'll have to think about Charles Leclerc too who once again starred, this time to finish seventh and within 20s of Vettel. 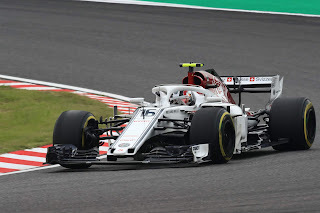 Leclerc's Sauber team-mate Marcus Ericsson deserves a shout out too as he qualified ahead of the pair in sixth place. His race barely got going though, as his team was patching up damage to the car before it even started and it wasn't clear if it got fixed as Ericsson then made first-lap contact with Romain Grosjean's Haas. He quit a while later with a very battered car. It was a reminder though just before he departs for IndyCar that, while he hasn't strung it together nearly as consistently as he should, when Ericsson is good he's very good. The closely matched Haas pair were next home after Leclerc with Grosjean ahead and carrying damage from the first-lap scrape, and Sergio Perez's Force India completed the scorers with a straightforward run. He was one of the very few to have a straightfoward time of it. Even if after the corkscrew route the guy very used to being at the front ended up being back just there.